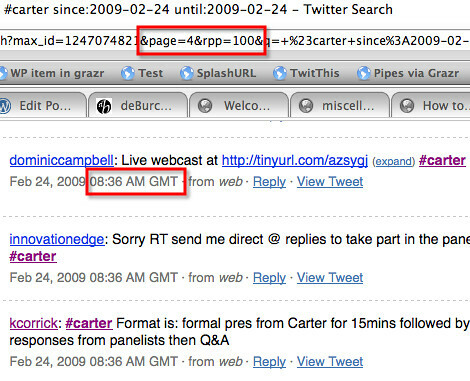 Last week, I wrote a post on hHow people Tweeted Through Carter on “Delivering Digital Britain” at NESTA, where I created a slideshow of tweets posted in response to the NESTA Delivering Britain event/video stream and used them to illustrate the audio recording of Lord Carter’s presentation. 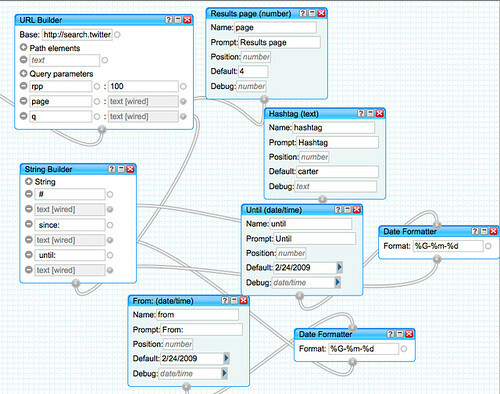 Chatting to @liamgh last week, I mentioned how i was stumped for an easy way to do this. 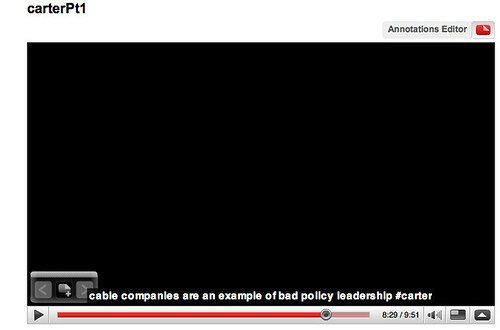 He suggested creating a subtitles feed, and then uploading it to Youtube, along with the audio recording (doh!). The first thing to do was check out how Youtube handled subtitles: Getting Started: Adding / Editing captions. 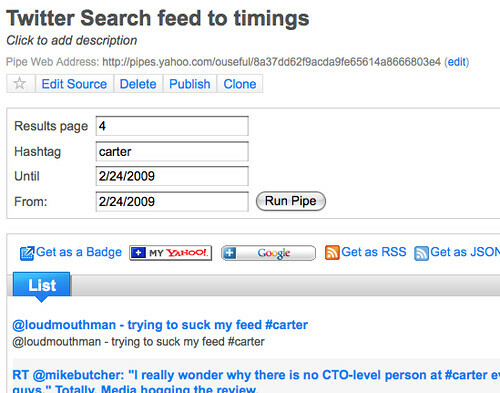 Secondly – getting the list of tweets hashtagged with #carter over the period Lord Carter was speaking (i.e. the period covered by the video). For the original proof of concept, I used the tweets from the spreadsheet of scraped tweets that @benosteen grabbed for me, though it later occurred to me I could get the tweets direct from a Twitter search feed (as I’ll show in a minute). The question now was how to get the timecode required for the subtitles file from the timestamp associated with each tweet. Note here that the timecode is the elapsed time from the start of the video. 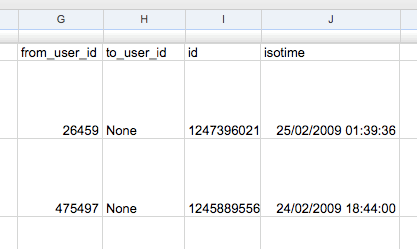 The solution I came up with was to convert the timestamps to universal time (i.e. seconds since midnight on January 1st 1970) and then find the universal time equivalent of the first tweet subtitle; subtracting this time from the universal time of all the other tweets would give the number of seconds elapsed from the first tweet, which I could convert to the timecode format. 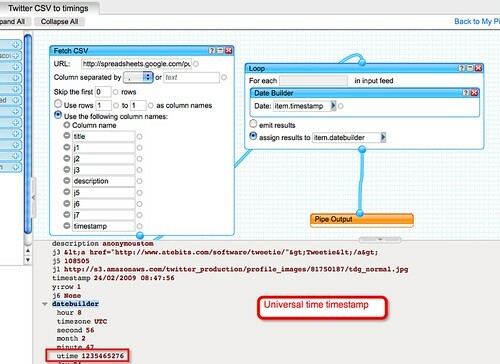 Copy and paste the output into a text file and save it with the .sub suffix, to give a file which can then be uploaded to Youtube. So that’s the subtitle file – how about getting the audio into Youtube? I’d already grabbed an audio recording of Carter’s presentation using Audacity (wiring the “headphones out” to the “microphone in” on my laptop and playing the recording from the NESTA site), so I just clipped the first 10 minutes (I think Youtube limits videos to 10 mins?) and saved the file as a wav file, then imported it into iMovie (thinking I might want to add some images, e.g. from photos of the event on flickr). This crib – iMovie Settings for Upload to YouTube – gave me the settings I needed to export the audio/video from my old copy of iMovie to a file format I could upload to Youtube (I think more recent versions of iMovie support a “Share to Youtube” option?). 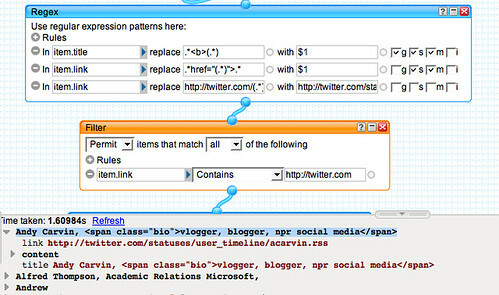 PS Also on the Twitter front, O’Reilly have started watching Twitter for links to interesting stories, or into particular debates: Twitscan: The Debate over “Open Core”. Chatting to @cheslincoln the other night, we got into a discussion about whether or not Twitter could be used to support a meaningful discussion or conversation, given the immediacy/short lived nature of tweets and the limited character count. I argued that by linking out to posts to support claims in tweets, “hyper-discussions” were possible. By mining “attention trends” (a term I got from misreading a tweet of Paul Walk’s that scaffold a conversation, it’s possible to create a summary post of a conversation, or argument, like the O’Reilly one? See also this post from Paul Walk: Anything you quote from Twitter is always out of context. 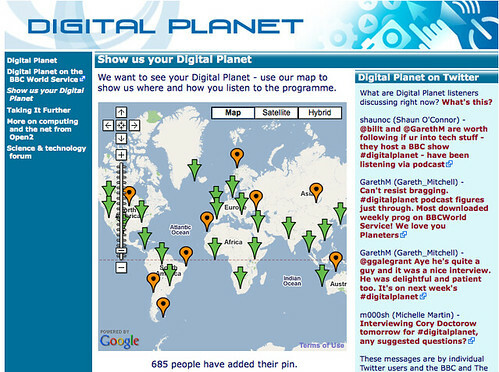 and I started to wonder whether there was a simple way of generating an embeddable map showing the location of people tweeting given a Twitter feed. 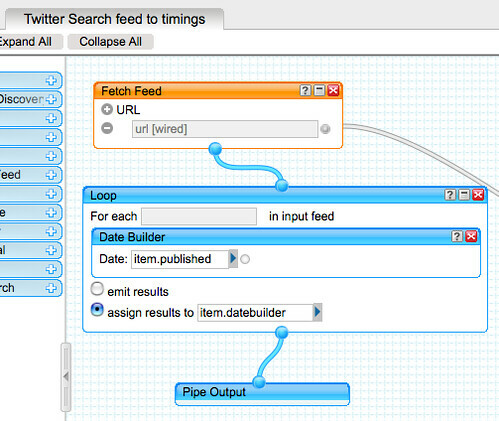 I couldn’t find one offhand, so here’s a simple pipe that will do the job: Simple Tweetmap pipe. 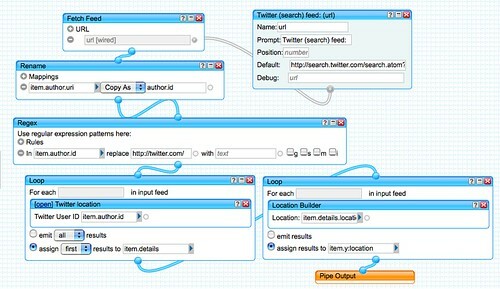 Here’s how it works: start off by grabbing a feed from Twitter, such as a Twitter search feed. 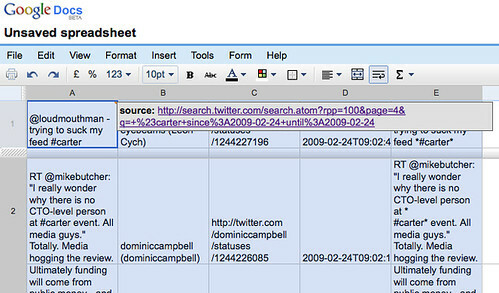 Using a Twitter feed URL as an input to the pipe, grab the feed and then find the Twitter username of each individual from the user’s Twitter URL. 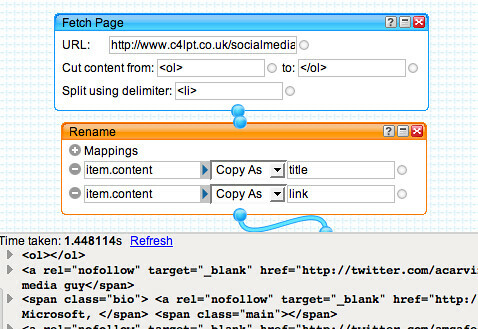 So for example, map http://twitter.com/psychemedia onto psychemedia. 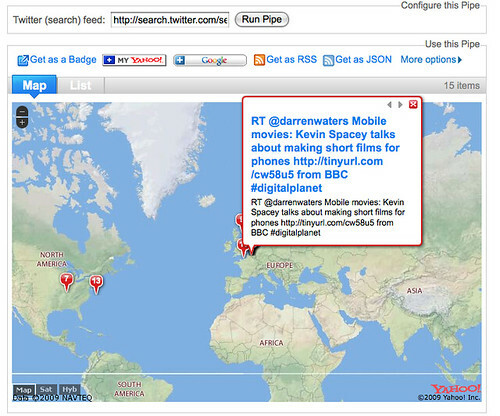 We now call on another pipe that calls the Twitter API to get personal details for each user who has a Tweet in the feed. 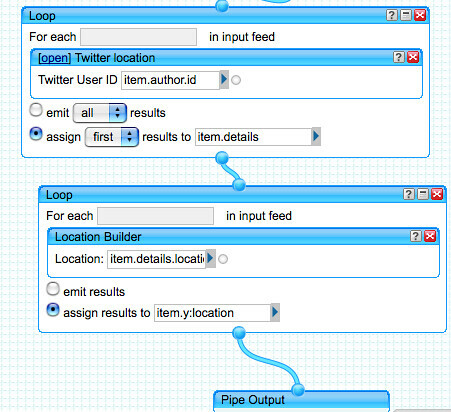 Here’s how that embedded pipe works: Twitter location pipe (it should really be called “Twitter User Details” pipe). 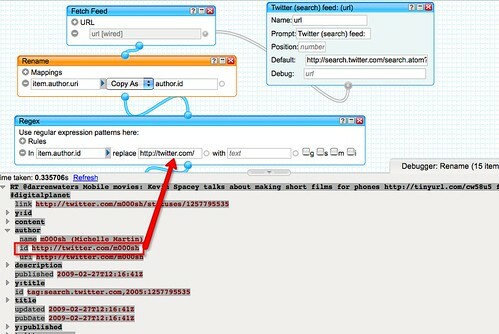 First, construct a URI that ask the Twitter API for the user details associated a particular Twitter username, (e.g. 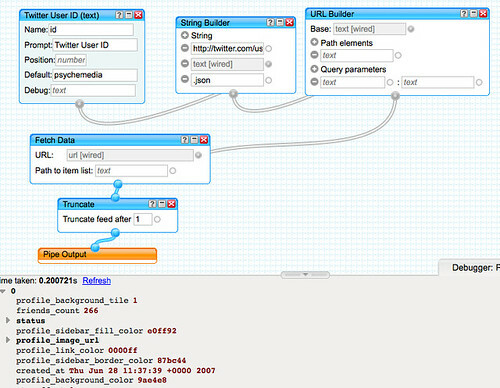 using the construction http://twitter.com/users/show/USERNAME.json) then pull the data back as a JSON feed. Finally, just make sure only a single record is returned (there should only be one anyway). 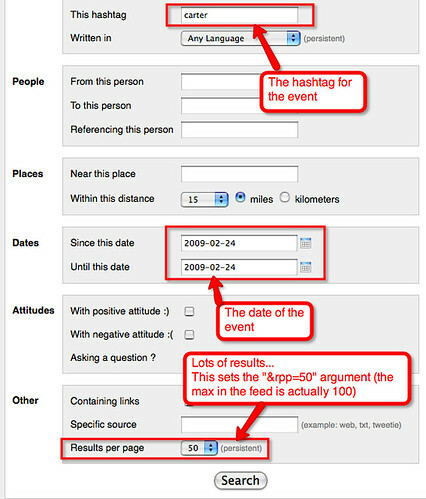 Next step is to persuade the open2 team to start archiving appropriately tagged tweets and displaying them on a cluster map view over time :-) We could maybe even link in a timeline using something like TimeMap, the MIT Simile timeline and Google Maps integration library…? 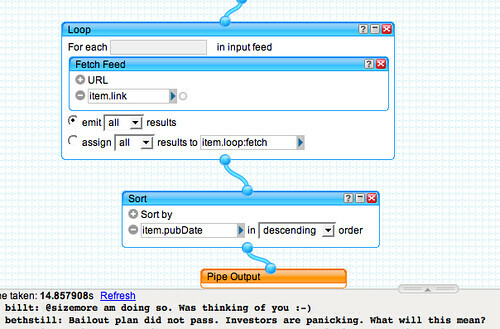 From the pipe, subscribe to the aggregated edutwitters’ feed. 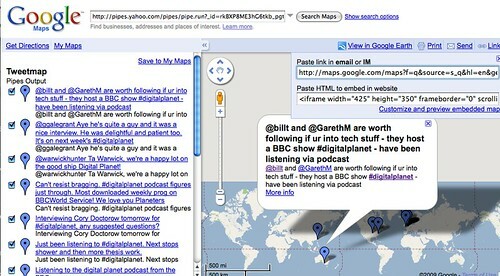 A more efficient route might be to produce an OPML feed containing links to each edutwitterer’s RSS feed, and then view this as a stream in a Grazr widget.